Billy Showell enjoys worldwide acclaim as a tutor and her instruction books get top ratings from her legion of fans. 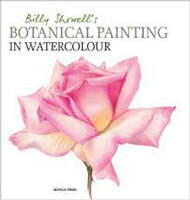 Billy is best known as a best selling author of four very popular and highly recommended instruction books about botanical painting. Her books are very much about botanical art rather than botanical illustration. She is also a very popular teacher of botanical painting through courses, workshops and her online website. She teaches in the UK, USA and Australia. 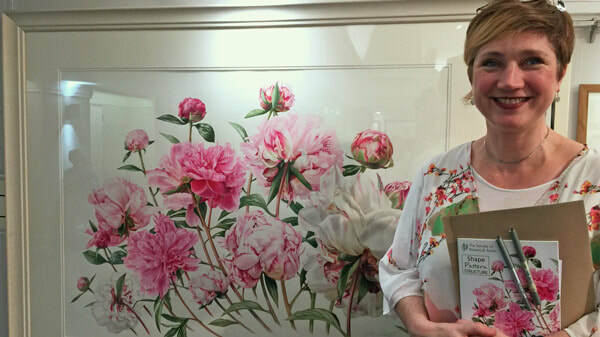 I've met many botanical art students who've said that her books have helped them a great deal. I think one of the things people particularly like is she communicates very well - both when demonstrating in person and when writing her books and producing her videos. I also see her paintings every year in the exhibitions of the Society of Botanical Artists in London. She's an excellent artist with a very strong and unique sense of design and composition. Her books are highly recommended for those who want to try developing the design aspects of their portraits of botanical subject matter. Billy graduated from St Martins School of Art with a degree in fashion design and illustration. She subsequently changed direction - to the benefit of botanical art. She has work in the collection of the Hunt Institute and Kew archives. In 2017, she won a Gold Medal at BISCOT and was awarded 'Best in Show Painting' for one of her paintings. Billy is President Elect of the Society of Botanical Artists and will become President in 2018. 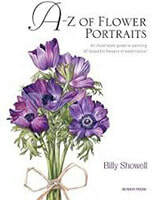 "Practice, planning and perfection are the keys to success"
HIGHLY RECOMMENDED: Billy's latest book focuses on what's required for Botanical Painting and is very comprehensive and immensely practical. If you buy just one of the Billy's books I'd recommend you buy this one. Billy is both articulate and economical with words - making her points simply and clearly. This means that all the text contributes useful and in some cases invaluable information. It might look simple at first glance bit it's actually very dense in terms of the information and techniques and tips shared - which is why I've highlighted what some of these are about. The icing on the cake is that the paintings are also fascinating to look at and the step by step demonstrations of which there are a few are very informative. plus lots and lots of very practical tips throughout. You'd think that by now Billy Showell has little new left to say about botanical painting - but you'd be wrong! ​#1 New Release in Watercolor Painting on Amazon BEFORE it was even published in the USA! This rapidly became an extremely popular book when published because it provided the sort of detail often lacking in more conventional books about how to paint flowers. There aren't too many botanical art books which focus purely on fruit and vegetables - as this one does. The first half of the book deals with Drawing, Colour, Composition, Techniques and Light and Shade. This book began doing very well when it was chosen to be the lead title by the largest art book club in the USA! This isn't a book for the complete beginner as it assumes quite a lot of experience with watercolour painting. It's more for the watercolour painter who now wants to become great at painting flowers without any visible means of support! This is a review by a big fan of Billy Showell's books. She's NOT a botanical artist but she's a huge fan of the scope and detail of the techniques demonstrated in the books. She's particularly positive about the number of images used for each technique demonstration.